Insurance companies market themselves as being focused on their customers' needs when disaster strikes, but the truth is that making a profit is their top priority. Unfortunately, this means that many legitimate claims are denied or underpaid. 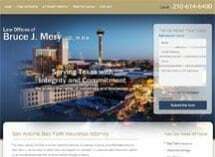 From the Law Offices of Bruce J. Mery, J.D., M.B.A., in San Antonio, Texas, we protect the rights of insurance policyholders by holding insurance companies responsible and fighting back against bad faith insurance practices. Our law firm has been prosecuting companies for bad faith insurance practices for more than 27 years. Whether the denied coverage is for property damage such as hail damage, wind storm, hurricane, plumbing leaks, or other claims including medical insurance claims, disability, life, or any other insurance claim, we have the unmatched know-how and experience to bring insurers to justice. If you are struggling with your insurance company over unpaid insurance claims, or if your insurer unreasonably denied payment or delayed payment, our law firm can pursue full payment as well as penalties and attorneys' fees. The Law Offices of Bruce J. Mery, J.D., M.B.A., also represents individuals in personal injury lawsuits, and cases involving unfair and deceptive trade practices, residential transactions, construction defects, employment law, probate, family law, real estate and business fraud, as well as all areas of commercial litigation at both the trial and appellate level. Our firm has advocated for individuals in personal injury and wrongful death cases for more than 27 years. We take the time to review all the facts of your individual case and fully explain your legal options. Our personal injury lawyer has extensive experience with a wide variety of cases. Although we have handled hundreds of these cases over the years, we understand that no two cases are exactly alike and we have the skill to handle a case of any size. At the Law Offices of Bruce J. Mery, J.D., M.B.A., in San Antonio, Texas, we protect the interests of laborers such as oil field and gas exploration workers and their families by holding these companies accountable. At our firm, we help prepare wills, trusts and other documents that allow our clients to give their assets to whom they want, how they want, while minimizing the costs of administration.